"[The army faced] a violent, terrorist demonstration at six points [along the fence. The IDF used] pinpoint fire [wherever there were attempts to breach or damage the security fence]." "All the fatalities were aged 18-30, several of the fatalities were known to us, and at least two of them were members of Hamas commando forces." "[If violence drags on along the Gaza border, Israel will expand its reaction to strike the terrorists behind it. If attacks continue, the IDF will go after terrorists] in other places, too. [Israel] will not allow a massive breach of the fence into Israeli territory." “We will not be able to continue limiting our activity to the fence area and will act against these terror organizations in other places too." "The large crowds ... reflect the Palestinian people's determination to achieve the right of return and break the siege and no force can stop this right." "Hamas is using you and distracting your attention from its responsibility to take care of you and govern the Gaza Strip. Hamas is sacrificing you to move forward with useless agendas and wasting millions instead of investing in your well-being." "Don’t let Hamas use you! Don’t put yourselves in danger for nothing. You deserve a better future than what Hamas has planned! You deserve more than a reality of violence, incitement and terrorism." "[The protests mark the beginning of the Palestinians’ return to] all of Palestine." "We are here to declare today that our people will not agree to keep the ‘right of return’ only as a slogan." The Israel Defence Forces, performing the function for which it was formed, is defending its borders along the Gaza coastal strip from penetration by Gazan Palestinians incited to 'protest' Palestinian-style by rioting and acting as human shields and coerced, manipulated civilians, giving cover to the 'militants' among them who throw Molotov cocktails and rocks at Israeli troops while rolling burning tires toward the barriers that restrain them from infiltrating the Israeli border. There are casualties in numbers; an estimated 17 dead with hundreds wounded; numbers given by the Islamist jihadi group Hamas, which Israel is unable for obvious reasons to verify, but the IDF does know that among those dead are members of the Hamas fighting forces. This is Hamas doing what it does best; combatively and rhetorically challenging Israel, to provoke its forces to respond with the kind of force that results in casualties among civilians to bring censure to Israel by the watching international community. The people of Gaza are fed an unvarying diet of propagandist hatred against Israel, to ensure they view the Jewish State as an impediment to their own strictured prosperity by denying them all that they have been taught since childhood to expect from life; above all, that the prosperity on which Israel is based is the Gazans' own heritage. And that only if they return to those places where those originally from areas in what is now Israel, a good life would be restored to them; the presence of the Jews preventing them from achieving their destiny. That the terrorist group dedicated to vanquishing the IDF and destroying the State of Israel, which dominates their daily life with actions and activities focused on that goal, ignoring the purpose of a responsible government to provide the template of infrastructure for the delivery of social support to the governed, is what has impoverished the people of Gaza bypasses them. For the lifetime of the oldest among them the international community has been providing funding and material support which their leaders have waylaid to fulfill their own designs. The desperation of indigent life in Gaza contrasts sharply with the wealth acquired by their leaders, by the sidelining of material support for the population toward Hamas projects, both costly in materials and upkeep and purposeless for the well-being of the subjugated held in thrall to the Hamas version of 'justice' seeking to destroy a nation, and enabling in the process tribal-religious conquest and a restoration of Arab 'honour'. 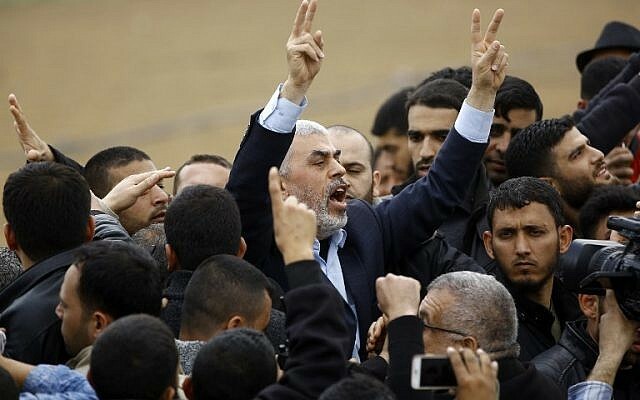 Hamas has enjoined Gazan Palestinians to march on Israel's border and to continue their barrage of protests and violence for six weeks until the day of Palestinian mourning and Israeli celebration is reached; for the former the Naqba, for the latter the establishment of the State of Israel. 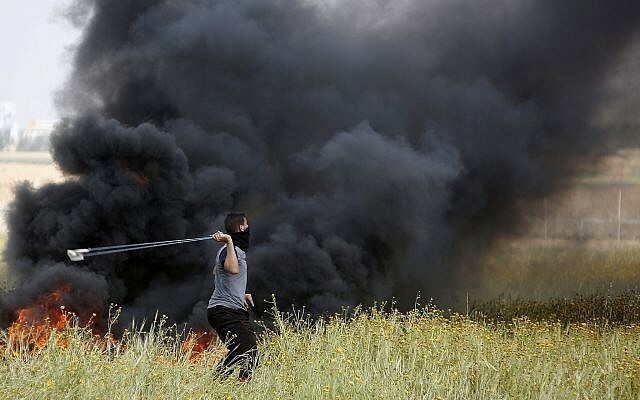 Persuading an estimated 20,000 Palestinians to march on the border throwing stones, firebombs and rolling burning tires toward troops on the opposite side. Sending children into the fray and toward danger; a tactic beloved by Hamas. The "right of return" insisting that millions of the progeny of the original 70,000 Palestinians who fled, overwhelm Israel, as simply another vehicle of destruction. Rising unemployment, miserable poverty, lack of power, and questions about the availability of potable water all make life intolerable in the Gaza Strip. Israel has done what it too does best; warning that it intended to make use of live ammunition, and scattering leaflets explaining that to come within 300 metres of the fence is to court direct danger. In response to which some of the Gazan civilians are indifferent, claiming their lives are so dire, death would be a relief. Not far from the border where protesting Gazans in family groups assemble, there is a different atmosphere, one of gaiety and celebration with family picnics, with stalls erected to sell ice cream, smoothies, nuts and sandwiches. Those gathered there seemingly unperturbed as ambulances screech beyond them carrying injured, and even while drones drop tear gas canisters. "We are here to say we want to return to our land", 65-year-old Suheila Abu Rish said of her family displaced from Ashdod 50 kilometres up the coast, during the 1948 Arab-Israeli war. A war where Arab armies coalesced after persuading Palestinians they could soon return, once the Jews had been torn away from the land, vanquished and bleeding, to surrender their new state, returned to Arab rule. This was before Suheila Abu Rish's birth; it occurred 80 years ago, but the fallacy of return is kept alive and burning in the consciousness of a people whom other Arab states never had any intention of welcoming as citizens. As Jews embark on their annual celebration of Passover, their release from tyranny and renewed pledge as a people exiled from their traditional heritage landscape, the symbolism and rage of Arab displacement exemplifies the entitlement of a religion which had not existed until a thousand years later and a people for whom the land was foreign, to now claim it as their birthright. Even so, there is no coordination or singleness of purpose to benefit Palestinians between Hamas and the Palestinian Authority. No reconciliation possible between the West Bank and Gazan Palestinians with their leaders planning to demolish one another's leadership rights and lives. The latest efforts at peace between them destroyed when Hamas launched a bomb to kill the PA prime minister and intelligence chief in a convoy on a road in Gaza. Typically, the Palestinians choosing lethal violence to settle matters of disagreement and restore tribal 'honour'. 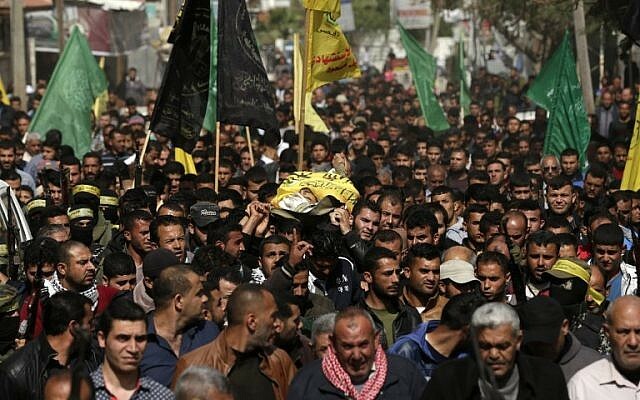 Hamas announced on Saturday that five members of its military wing, the Izz ad-Din al-Qassam Brigades, were among 16 Gazans they said were killed on Friday along the security fence with Israel, claiming those killed were taking part "in popular events side-by-side with their people". 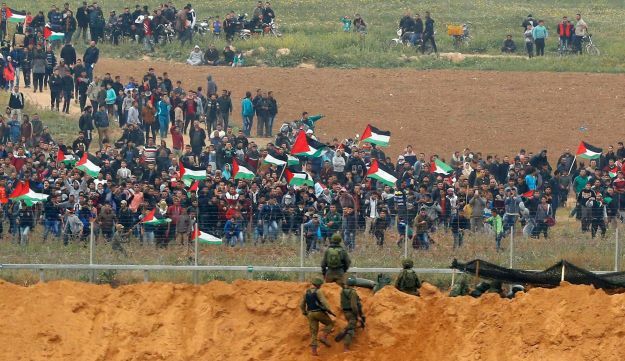 Maj.Gen.Eyal Zamir of IDF's Southern Command spoke of Hamas planning attacks under the shield of demonstrations: "We recommend to civilians not to come near [the fence], and warn Hamas that it is responsible for everything that happens in the Gaza Strip with all its consequences." For their part, and unsurprisingly, Egypt, Jordan and the Arab League have condemned what they term 'excessive use of force' against demonstrators on Israel's part, while the organizers of the march have appealed to the United Nations and Arab League to establish an international commission of inquiry to investigate their charges of Israel's excessive force against Palestinian demonstrators. A well-orchestrated and familiar choreograph that will ensure further censure of Israel by the general assembly of the UN. "[There is a] growing body of evidence that people who used watercraft were able to thrive on the Pacific Coast of Canada at the end of the last Ice Age." "It is possible that the coast was one of the means by which people entered the Americas at that time." "We are working to collect more information on areas that were ice-free during the last Ice Age and reconstructing where sea level was at different times in different places." A line of research still "in its infancy" is being pursued by a team of archaeologists studying a prehistoric settlement on the coast of Calvert Island, British Columbia. The researchers discovered footprints etched in soft clay that date to the end of the last Ice Age, 13,000 years old, making them the earliest such findings in North America. Radiocarbon dating of two pieces of pine wood lodged in the foot imprints place the footprints in the middle Stone Age. Published in the journal PLOS One, these findings serve to corroborate a theory holding that some of the earliest settlers in North America arrived by boat. The 29 distinct footprints were discovered beneath a muddy surface, coated with a layer of sand, itself covered by a layer of gravel and more clay, all of which levels shielded them from erosion. Researchers identified the footprints as those of at least two adults and one juvenile. The site was originally investigated in 2014, where the researchers hoped to find "Ice Age sediments with archaeological remains". What they discovered appeared to be a track mark covered with bogs and dense forest. Returning in years that followed they found the buried footprints and theorize they were of people gathered around a hearth. The sea level was six to ten feet lower, at the close of the last Ice Age -- from 11,000 to 14,000 years ago -- the footprints possibly left just above the high tide line. As popular theory has it, humans first reached North America through an ice bridge that connected Siberia and Alaska during the last Ice Age. These first people, according to the theory, entered through the small corridor that became the passage to the new world. But the new research indicates ocean-faring represented another viable path. The remote location surrounded by thickets was reached by ferry boats since the closest road was about 40 kilometers' distance. Oral history common to the area for thousands of years where Heiltsuk Nations hold the stories of arrival since "time immemorial" has resulted in a melding of science and archaeology matching and validating these ancient stories of arrival in a new land. "He yelled at me and asked why a woman was doing the work. I was mortified." "I always think it's clearly an idea thought up by men [pink toilets with floral patterns to make women feel more at home in a industrial environment]." "I think the government should simply pursue things that would make it easier for both women and men to work." "I used to dream about going back to the field [engineering]. But now, I leave it up to the younger generation [of women]." "There are still plenty of men who don't want to take orders from women." "You can make the work seem glamorous, but many women end up quitting when they see it for what it is." "There's definitely this image of construction being a macho industry." "But I heard that more women were joining, and I always dreamed to be one of them." 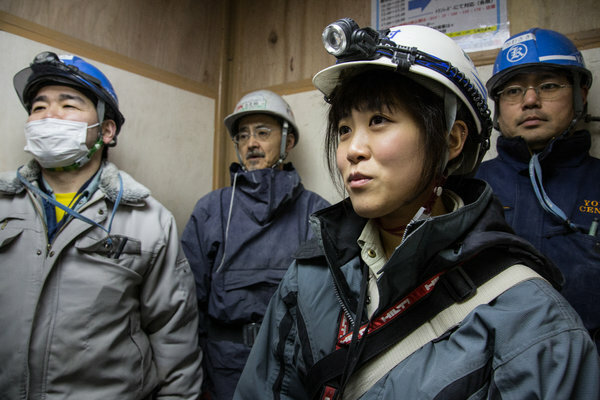 Back when Maho Nishioka, having gained her engineering degree, showed up at her new job at a construction site where she was meant to supervise work at the site, the workers refused to talk to her, let alone obey her professional instructions. An angry client once insisted she stop inspecting a bridge, despite that she was the sole engineer on site qualified to do so. In Japan, female workers are underemployed and underpaid. Unsurprisingly, that male bastion of employment, the construction industry has distinguished itself by being the unfriendliest toward women attempting to enter the field. Twenty years after Ms. Nishioka's first day on the job, the construction industry has embarked on a marketing campaign to convince Japanese women that construction work might be beneficial to their plans for satisfying employment. The industry is in a steep decline, experiencing its most serious labour shortage in years. Now, both government and industry have set out to convince women that construction work is calling out to them; the goal, to double the number of women in construction. Long hours and relatively low wages, however, hamper the drive. Which has led government to create a website to convince young women how interesting various positions in construction might be for them. The website links to a cartoon showing a woman wearing a pink, heart-patterned uniform, holding a pink, heart-shaped welding mask. Ridiculous it may seem, even to prospective industry workers, but then the Japanese are inordinately fond of cutesy cartoons. Female workers have been provided with portable toilets and dressing rooms; you guessed it -- coloured pink and elaborated with floral patterns. The country's public outreach includes awarding public works projects to certain companies employing women, hiring consultants to hold seminars for construction executives, and taking surveys of female workers. Prime Minister Shinzo Abe calls the women-in-the-workplace efforts, "Womenomics", encouraging companies to promote diversity and promote female managers. One might think he had taken lessons from Canada's Justin Trudeau! Over three-quarters of working-age women are now in the Japanese labour force. Four years into the drive to double female construction engineers and skilled laborers to 200,000 by 2019, the rise has been disappointing, since women represent only 3 percent of the workforce in the industry. Despite labour shortages, construction workers earn 25 percent less than their peers working in other industries, and women in construction earn 30 percent less than their male counterparts. woman to be seen around. "I thought I was going to die on the spot. I cried all the tears in my body and I thought of her. She didn't deserve this." How can one do that to anybody? The police revealed she was stabbed eleven times." "There was nothing to steal. My mother was poor. Her credit card? She would have only been able to withdraw 100 euros. She had no money on her account." "My mother had a thirst for knowledge and meeting new people and talking to them and that's what killed her." "[While she could still walk] she was going to restaurants, to theatres, to cinemas to see movies. She likes so much to read, she likes life so much." "All those people [Muslim jihadis] who know war, they like life, maybe more than these crazy people [who killed her]." "[The attackers] burned all of our memories, burned my entire childhood that I experienced there, in photos, albums, souvenirs." "Today it is my grandmother and tomorrow it will be a grandmother, a grandchild, someone else's father." "[French authorities should] stop making excuses and see reality for what it is." 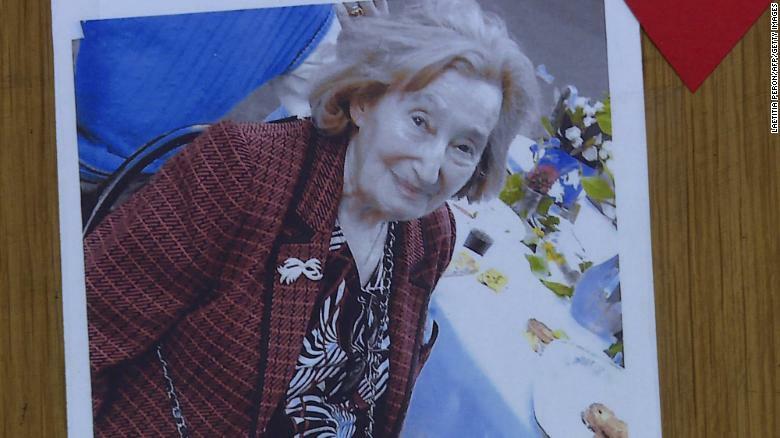 Reality for the present is that thousands of people in France came out in a mass demonstration of sorrow at the death of this 85-year-old grandmother and Holocaust survivor. A woman who lived alone, refusing to leave Paris. Her life was threatened when, at age 9, French police acted with alacrity at the Nazi orders in occupied France, to round up French Jews. Her life was horrendously taken from her 76 years later long after the Holocaust years when she returned from safe haven abroad to resettle in France. Her enemies during World War II were the fascists in Germany who dominated Europe. Her enemies in her later years came with the influx of Muslim immigrants who would mass in demonstrations against Israel and Jews, vowing they would act to complete the Holocaust that failed to eradicate Jews worldwide. The France that had once again become safe for Jewish return after 1945, has been transformed at the present to one unrecognizable from that era, rife with anti-Semitism emanating from a new and virulently hateful source; Muslim immigrants. Last Friday was the last day of life for Mireille Knoll. She was stabbed to death, her apartment set on fire. Preliminary charges have been laid against two men for her murder, with clear anti-Semitic motivation, found in the Koran. One of the two is a neighbour who has known the elderly woman since he was a child. To whom she had been kind and neighbourly, inviting him to her apartment on many occasions. That familiarity failed to expunge the Islamist hatred that burned in his consciousness. She had escaped Nazi-occupied territory to flee to southern Europe, and then Canada, returning to her beloved France at war's end. Her grandchildren, along with countless other French Jews, recognized the changes taking place in France and chose to leave, to move to Israel, leaving Mireille Knoll on her determined own in her apartment where she had lived her entire Paris life, on Avenue Philippe Auguste. The same building as her 29-year-old assassin. 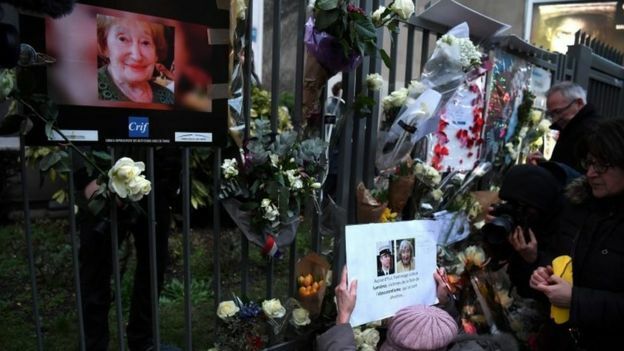 Not only had this elderly French Jewish woman complained to police that she had been threatened by a neighbour who had stated his intention to set fire to her home, but according to a police source, one of the two men detained in her murder had been convicted previously, on charges of molestation of a twelve-year-old girl who had been staying over at Mireille Knoll's flat. The horrendous murder of 65-year-old Sarah Halimi, beaten and thrown from her balcony a year ago, an earlier atrocity. With more to come. His mother, Daniel Knoll explained, had known the suspect since he was seven. She "took pleasure in having him at home and ... although we'd asked her not to welcome him, she let him in like she always did, the same way she did with everybody, with kindness". French President Emmanuel Macron tweeted (that indispensable tool for politicians; a rude instrument of mass communication) his "absolute determination to fight against anti-Semitism." How do you 'fight' an ancient scourge constantly resurrected and particularly beloved by Islam, when France no longer resembles itself, transformed beyond what it has been into what it would never have imagined it might become; a Muslim-state-in-waiting? 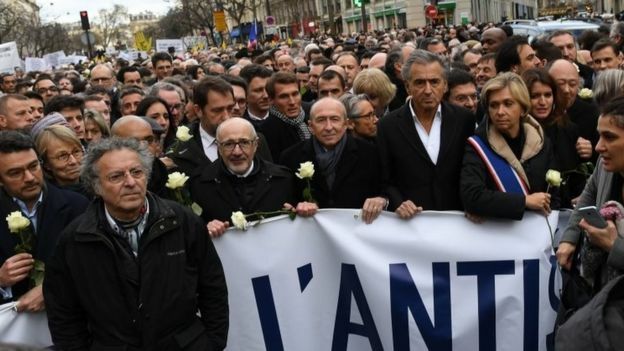 Put a stop to anti-Semitism in France when its practitioners are untouchable? The banlieues festering in grim attendance on French Muslim hostility toward their hosts, where police, firemen, ambulances fear to tread? Where the imminent-next battle between Hamas terrorists in Gaza and Israel Defence Forces will bring out violent protests erupting once again, taking to the streets condemning Jews and clamouring that they will finish the Holocaust, delivering Jews to the jaws of fascist-inspired death chambers again. For the meantime, it is, however, one outrage at a time, a death here, a death there. Encouraging fearful French Jews to leave, leave France for the occupation of its Muslim hordes. "I started to crawl but I realized I had no strength. I had inhaled so much smoke that I was on the verge of fainting." "My daughter was ringing and ringing me. I could only shout down the phone that she should try and get out of the cinema but I couldn't do anything -- there were flames in front of me." "They [emergency services] took three minutes, three [expletive] minutes! -- to put on their masks." "The whole system of fire safety oversight has become a huge trough of corruption." "I no longer have a family. The ruling regime is guilty. Every bureaucrat dreams of stealing like Putin. Every state functionary treats people like garbage." "[Government investigators] will find a scapegoat, and the issue will be done with, but the threats — incompetence, widespread corruption, alcoholism and total degradation of society — will go nowhere." "We're not calling for blood. The children are dead, you can't give them back. We need justice." "They died because they were locked in a movie theatre. They were calling from there, asking for help: 'We're locked in, we're suffocating.' No one helped because when the blaze broke out, everyone ran away." 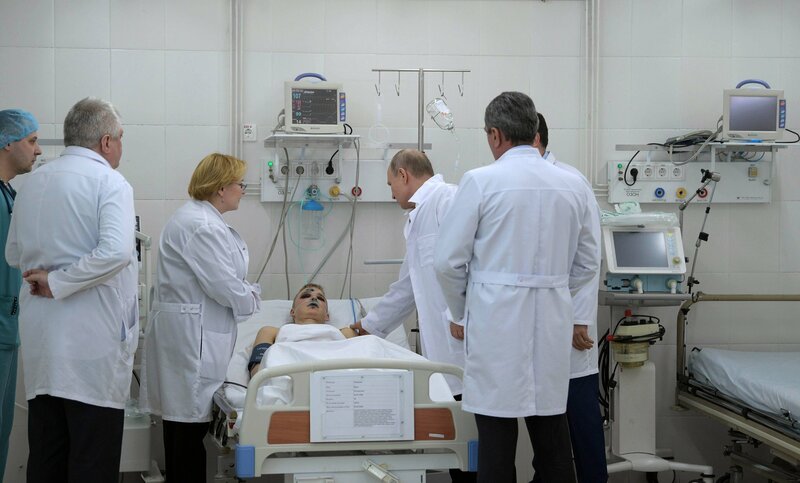 "Even if the official death toll reflects reality, at the end of the day people know how the government lied in Beslan, Nord-Ost, Kursk and many other places." "So they have themselves to blame for the spiraling level of distrust." Utter devastation. Schoolchildren, 41 enumerated out of a total of 58 dead. The count is not complete, not yet. There are too many people listed as missing. It will take time before a realistic accounting of how many people died in the multi-storey shopping centre in Kemerovo, Siberia. School was out for Easter, and a class of 11-year-olds with their teacher went to the mall for some sports activity. Other children were in a movie theatre, like Olga Lillyevyali's three girls. "Our children burned while we just watched", cried the stricken mother, forced to stand outside the shopping centre while the fire was razing the building, her children and her husband within. Her husband had taken their twin daughters, age 11, along with their five-year-old sister, to see the children's film Sherlock Gnomes in the afternoon. He stayed in the mall, waiting to hear from his daughters when the film was over and they would all drive home together. Never again. The telephone call he was awaiting came much too early when one of the girls called him to inform her father that they were trapped behind a locked door with a spreading fire. And he raced up to the level they were on. The locked doors his children were faced with were pro forma where in Russia, doors to cinemas remain locked during the screening to ensure that people could not enter without buying a ticket. From later media reports it seems that the initial blaze occurred on the fourth floor, conceivably at a trampolining centre, where it rapidly spread, with huge clouds of suffocating black smoke emitted. According to eyewitnesses, building staff did nothing to arrange for evacuation from the burning building, a conversion of a former confectionery factory, completed in 2013. After this tragedy, the office of the Prosecutor General has ordered shopping malls across Russia checked for fire safety features. One 11-year-old boy leaped from a third-floor window to escape the fire and the smothering smoke. He is now an orphan. Both parents and a sibling died in the fire, his life completely transformed. What began as a family expedition anticipating fun and entertainment, enjoyment in being together, lively encounters and exposure to others having a good time as well, transmogrified into a ghoulish scenario straight out of a lunatic hellscene. On a trip celebrating the end of the school term, eight children between 11 and 12 from a local village of Treschevsky died in the hellish blaze. One of the girls of the group, 12-year-old Viktoriya Pochankina, called her aunt asking her to tell her mother she loved her. What a tortured memory for the survivors, an anguishing glimpse at the end of all that matters. Tatyana Darsaliya, 36-year-old schoolteacher, took her daughter to safety, left her then to return to the building as it burned, in an effort to save other children. Her mother, wrote Eleonora, "died like a hero". "It's not regulated and it should not be allowed." "It's like allowing someone to walk on the wing of an airplane, and in my judgement poses too much of a risk." "It almost looked like it was landing." "It wasn't moving fast. We were curious where it was going to land. Then the next minute, it was diving into the river." On March 11, New York City was the locus of an air tragedy. Only the pilot of a tourism, sightseeing helicopter operated by Liberty Helicopters, an Airbus AS350 B2, was able to save himself. His five young passengers from their early 20s to 30s, all died. 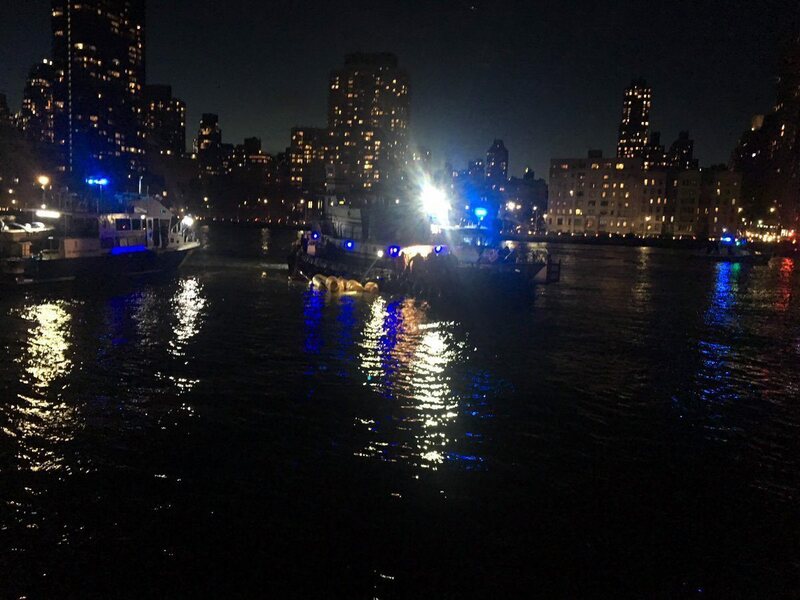 Pilot Richard Vance, 33, formerly a helicopter instructor from Connecticut, circled his craft around the Statue of Liberty then headed toward Manhattan with his passengers that night. This was a doors-off photo flight. The passengers were cinched into heavy-duty harnesses, tied to the helicopter floor. Immersed within the harness was a knife. Before takeoff the passengers had watched a ten-minute video showing them the knife the harness was equipped with, to be used should they become trapped. The briefing failed to state how they should saw through the nylon ties, nor even where the knife was actually located within the harness. Doorless helicopter flights have become increasingly popular in the tourism industry. At one time only professional photographers would find them useful, but the aircraft have been marketed to tourists, to be enabled to snap photographs of the skyline on Instagram. Major cities like Miami, Los Angeles and San Francisco feature these flights where sight-seers, untrained, unaware of adequate escape manoeuvres and improperly clad for wind-whipped conditions, regardless clamber into the doors-off helicopters. The harnesses cannot be removed expeditiously should an emergency arise; the false sense of security the instruction video gives passengers adds nothing to their safety. On the evening of March 11 when their helicopter went down into the East River the passengers were securely cinched in. The helicopter dragged those helpless passengers 50 blocks south, upside down, underwater, until rescue divers cut them free of the death traps the harnesses represented. The pilot explained that he had issued a mayday call of "engine failure", informing investigators the fuel shut-off switch may inadvertently have been struck by passengers or become in some manner wrapped up in onboard equipment, choking off supply to the engine. Puzzling aviation experts who failed to imagine that to be the case when the switch was located on the floor in the front area of the cabin. Liberty Helicopters, owners of the Airbus AS360 B2 that crashed, was involved in a collision over the Hudson River in 2009, where a helicopter hit a small private plane leading to the deaths of six on the helicopter and three on the plane. Two years before that, a Liberty tour helicopter crashed into the Hudson River; on that occasion all occupants of the helicopter fortunately survived. "They kill people every year", said aviation safety consultant Bruce Hunt in Colorado, remarking on the terrible safety records of these tour companies. The company that booked the flight, FlyNYON's website, boasts of the thrill to be had taking photos from an open-sided helicopter "accessible to everyone". "If you take coal out of the ger, people will burn anything, the tires on their cars, their neighbours' fences." "It's hard to survive in minus 30 degrees." "[Because of the pollution] a simple flu becomes a pneumonia or bronchitis very easily." "It's a fairy tale [that the government of Mongolia will be able to enforce its coal ban]." "There are thousands of families who mine, sell and burn coal in order to live." "It’s still the warm season, so the cold and air pollution aren’t too bad at the moment. You should come back in January to see it at its worst – when people living in these poor neighbourhoods don’t have anywhere to dispose of the ash and leave it in the streets. The ash flies with the wind. That’s when Ulaanbaatar turns into a massive ashtray." "My sister-in-law died from lung cancer a year ago. She lived only three months after the diagnosis." "My sister’s father-in-law also recently died from lung cancer. Then, a year or two ago, her friend died from lung cancer. These were all healthy people. They didn’t drink or smoke. They didn’t have bad habits. They only lived in Ulaanbaatar." "Small children – or anyone who is shorter than 1.5 meters, really – experience the worst form of air pollution. In deep winter, they inhale all the ashes rising from the ground." This is a problem that a wealthy nation like Canada has not had to face, although until a year or so ago, it was number second in the world in the distinction of its capital city, Ottawa, recognized for its snow and ice, second only to Ulan Bator in Mongolia. Close to 1.4 million people live in Mongolia's capital city. And throughout the winter months smoke rises steadily from the chimneys crowding the city. Not only is Ulan Bator known for being the coldest capital city in the world, it has the highest recorded air pollution level as well. Megalopolises like Beijing and New Delhi, with their massive populations are known for the dreadful pollution they produce, enclosing those cities, cutting them off from sunlight, challenging residents' health. But they come second to Ulan Bator for the sheer weight of pollution that menaces the lives of people living there. Local government statistics reveal that around 80 percent of the air pollution in the city is produced by over half the population who live in the "ger" districts in the city's north. 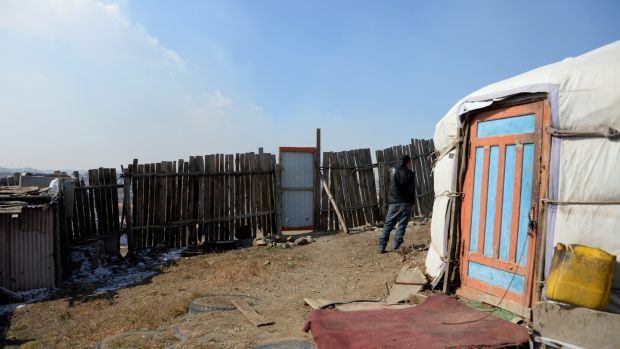 Gers are the traditional dwellings characteristic to the nomadic Mongolian herding lifestyle. 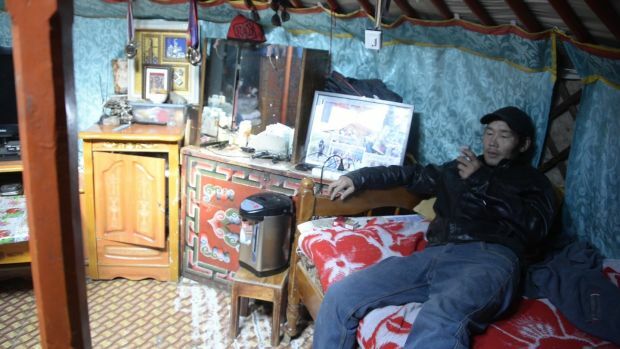 It is a yurt, a circular tent, a single living room where a family's bedding and furniture are arranged around the stove that makes life possible in such an extreme winter climate. The functionality of the yurt for a nomadic people is well known; readily disassembled and moved and set up again in a few hours' time. The life of pastoral sheep- and goat-herders. But the tough life of the nomadic herders was dealt a blow when unusually cold weather even for Mongolia killed off many livestock. Hundreds of thousands of people had little option but to leave their nomadic herding lives, hoping that opportunities for employment awaited them in the Ulan Bator of mineral mining. Recently, predominately lower-to-middle-income migrant workers have created their own adjunct to the city, unplanned districts where the poor burn millions of tons of raw coal yearly. Although raw coal is relatively inexpensive, some city dwellers on these ger outskirts cannot afford even coal, and burn whatever they can; garbage waste, plastics, whatever they feel can be consumed by fire and create warmth for their circular living space. At the end of January, a pollution station in Ulan Bator recorded a reading of 3,320 micrograms per cubic meter of air, representing 133 times what is considered safe by the World Health Organization; six times what is considered hazardous. That same month, Mongolia's Prime Minister Ukhnaagiin Khurelsukh decided to announce the use of raw coal in Ulan Bator would be banned. So from April 2019 forward the drive to improve the city's air quality will surge toward the future by banning the use of raw coal. Since January 2017, subsidies have been available for the use of stoves producing less pollution. Use of electricity during the night in many of the city's worst-polluting districts was made charge-free. But to adequately heat a thinly insulated home on a winter day with electricity remains out of reach; too costly for the poor. "First the weak ones [among his herd of sheep and goats] started to die and we hoped the rest would survive, but they didn’t." "There was too much snow, so they couldn’t eat. They got skinnier by day and died one after the other. By the time the winter was over, we had lost all our animals." Demented? Or Just Islamic? !God Is Great! "We heard an explosion -- well, several explosions. So I went to see what was happening and I saw a man lying on the floor and another person, very agitated, who had a gun in one hand and a knife in the other." "[The] very agitated man shouting several times 'Allahu Akbar'." "At that moment he [the shooter] ran after me. Of course I left, I lost him and when I turned around he wasn't there anymore. I took an emergency door and saw the police arrive." "[I] heard people shouting and a big boom. It was a gunshot. Then a second gunshot. After that, my colleagues came towards me saying: 'Come on Jacky, we need to leave, there's someone who's firing shots, he's shouting 'Allahu Akbar', and he's shot people and he's shooting at everything'." "We have an emergency exit behind the butcher's stall and we ran away across the courtyard. We also helped people get out." Still from video: CNN Police respond to the hostage situation Friday in the southern French town of Trèbes. France, with the largest contingent of Muslims in all of Europe -- an estimated six to eight million Muslims -- has experienced its share of Islamist terrorist attacks. Those viciously deadly attacks are the most volatile of the explosive events the international community becomes aware of through the prevalence of social media and newswires now swift to pick up and exploit shocking news coverage of Islamist religious dysfunction roiling Western societies. From the establishment of those infamous ghettoes known as banlieues, "no-go" zones where non-Muslims are unwelcome and where disturbingly criminal behaviour and violence prevails to the extent that firemen, police and ambulances are attacked should they attempt to enter -- to the occasional very public 'protests' that take place from time to time with demands and assertions completely contrary to French values and virtues -- this is another European nation that is slowly being absorbed by Islam. "Radical" Islam as some would prefer in an effort not to offend. Choosing to bypass what has become obvious to some, that what the infiltrated Muslim presence in every facet of life in Europe represents is a gradual jihad; the state of Islamic conquest that every faithful Muslim is required as a basic precept of their faith to engage in. Among those infiltrators is a significant percentage that views violent jihad as legitimate, and it is among the principal tenets of Islam. Another significant demographic within the Muslim community is willing and eager to conduct active, violent jihad. In this latest drama that focused France on the looming malaise in their midst, a petty criminal known to police activated within himself the martyrdom-for-Islam complex in the service of Islamic State of Iraq and the Levant, to mount hours of carnage, killing three people and seriously wounding another 16. Among the wounded was a veteran police officer of immense courage who volunteered himself as a hostage in exchange for a woman being held by the terrorist. Of Moroccan extraction, French citizen Redouane Lakdim set out to destroy the peacefulness of a southern France area yesterday. 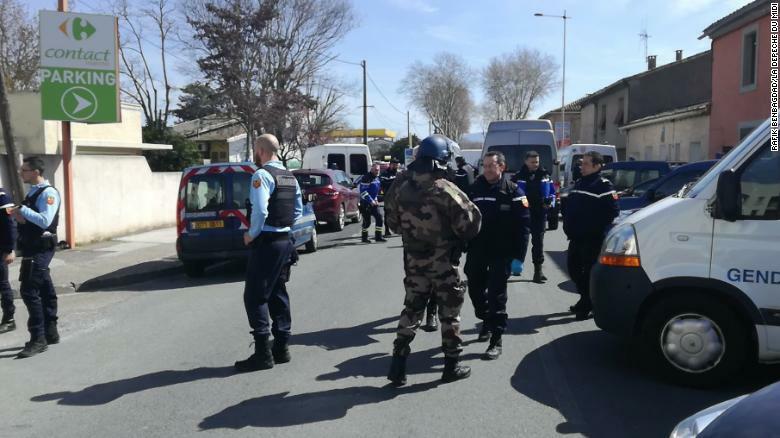 Hijacking a car, he killed one occupant, wounded the second and made his way from Carcassonne to nearby Trebers, to a supermarket, there shooting and killing a store employee and a customer. On his way to that destination he shot at four police officers who had been out jogging, hitting one in the shoulder. At the supermarket, this fervent follower of Islamic State took hostages when police arrived. This was when Arnaud Beltrame, 46, a decorated military police officer who had previously served France in war zones with great distinction, offered to exchange himself for the sole woman the murderer was holding hostage. The standoff with police took place over a number of hours. At a juncture when police waiting for a break and listening to Lieutenant Colonel Beltrame's open cellphone for clues heard shots, they stormed the scene and a shoot-out occurred. Officer Beltrame was shot in the neck, the terrorist was shot to death. Police later discovered two unexploded homemade bombs, a 7.65 mm pistol and a hunting knife possessed by the Islamist terrorist, while searching through the market after the attack. Authorities knew of Radouane Lakdim's links to radical Salafist networks. They considered him, doubtless, only a petty crook and drug pusher. Without an iota of doubt there are many such like him, in the banlieues; thugs, criminals, gang members, drug traffickers. These are all lifestyle highlights that appear to disproportionately attract young Muslims wherever they settle. It should be considered by intelligence agents an easy transition from petty gangster to Islamist terrorist among Muslim youth on the basis of reality and experience. But that kind of thought sequence, logical as it might seem has the odour of "profiling", once a respected and useful tool for those in the business of security of populations. No longer; aggressive, righteous Muslim groups employing the very sensibilities of trust, accountability and acceptance that allowed them to infiltrate the West and which they have exploited to its full potential while resisting the normalcy of integration and acceptance of Western values, have instilled a sense of guilt through charges of "Islamophobia", a most effective tool in the Muslim arsenal of disarming the non-Muslim community. The values that have traditionally reflected the quality of French life, its history, society, politics, culture and justice system, is spurned by Islam which agitates forcefully for Islamic Shariah. And this is the kind of challenges that a man of the calibre of Lt.-Col.Arnaud Beltrame must interface with. He served in Iraq in 2005, and earned an award for bravery in 2007. He spent four years as a commander in the Republican Guard, providing security at the Élysée Palace for France's president. He was knighted in 2012, inducted into France's prestigious Legion of Honor. 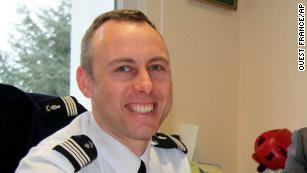 In 2017 he was appointed deputy commander of the anti-terror police in the Aude region.And he assiduously prepared for the role that would conclude in his surrendering his life in the defence of France's democratic values when he led a simulated terror attack in December on a supermarket -- presaging the one in which he Friday gave his life. Yesterday, [March 13, 2018] the White House hosted a conference with representatives from 20 countries, including Israel and many Arab states, to discuss solutions to the worsening humanitarian and economic conditions in Gaza. The conference, convened by White House Senior Advisor Jared Kushner, Special Representative for International Negotiations Jason Greenblatt, and members of the National Security Council (NSC) staff and the Department of State, was attended by representatives from the United Nations, the European Union, the Office of the Quartet, and the following countries: Bahrain, Canada, Cyprus, Egypt, France, Germany, Ireland, Israel, Italy, Japan, Jordan, Kingdom of Saudi Arabia, Netherlands, Norway, Oman, Qatar, Sweden, Switzerland, United Arab Emirates, and the United Kingdom. The White House conference built upon a meeting held in Cairo, Egypt, last week, and will carry ideas forward to the Ad Hoc Liaison Committee (AHLC) meeting in Brussels, Belgium, at the end of the month. The Administration of President Donald J. Trump believes that deteriorating humanitarian conditions in Gaza require immediate attention. The situation in Gaza must be solved for humanitarian reasons and for ensuring the security of Egypt and Israel. It is also a necessary step toward reaching a comprehensive peace agreement between the Israelis and Palestinians, including Palestinians in both Gaza and the West Bank. The attendees yesterday discussed concrete proposals for finding realistic, effective approaches to the challenges Gaza currently faces. White House officials presented specific project ideas, developed in conjunction with the NSC staff and Department of State officials, which the AHLC may seek to fund through discussions at its upcoming meeting in Brussels. The nations and entities represented at the conference have the ability to work together and make a difference. The dialogue will continue, in the coming days, in close coordination with other stakeholders, as all parties take tangible steps toward making meaningful improvements in the humanitarian and economic situation in Gaza. When President Donald Trump made his announcement that the United States finally would formally recognize Jerusalem as the capital of Israel, and make plans to move the U.S. Embassy in Israel from Tel Aviv to Jerusalem where all Israeli government agencies are located, the Palestinian Authority went into hissy-fit overdrive. At a subsequent meeting of the Arab League, Mahmoud Abbas went into paroxysms of shrill rage, condemning in no uncertain terms the White House and the Israeli government of Benjamin Netanyahu. Calling upon Arab nations to do their duty by the Palestinians to rise in rage and reject the American initiative, he fumed and fulminated and accused both the U.S. and Israel of all manner of dastardly plots against Palestinians. Others at the conference listened, drummed their fingers, yawned and failed to respond as instructed; no vehement protests were forthcoming from members of the Arab League directed either toward the United States or against Israel. Since then, all indications are that those same Arab states have attempted to reason with Abbas. The White House chaired a conference on the humanitarian crisis in Gaza last week. In attendance were the Arab states' representatives as well as Israel, and other members of the international community. Absent: Palestinian representatives; they simply would not lower themselves, preferring to retain their august dignity rather than attend such an event orchestrated by the White House and the president's son-in-law in his role as arbitrator urging a peace agreement between Israel and the P.A. The Arab states, those with Sunni majorities and Sunni governments were there for a dual reason. Relations with Israel have warmed behind the scenes, quite discreetly but quite practically, in a compact that unites them against the Shiite triangle of the Islamic Republic of Iran which has effectively captured Yemen, Lebanon, Syria and Iraq in its net, aiming directly to elevate Iranian influence and control of the Middle East. A prospect unbeloved by the Arab Sunni nations. 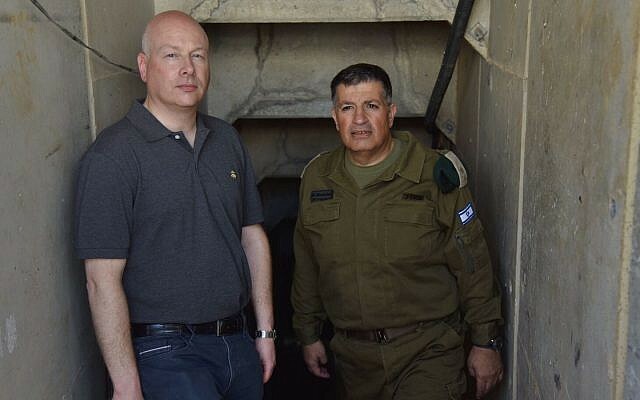 Which welcome Israel's powerful military might to its agenda. Saudi Arabia's Crown Prince Mohammed bin Salman, on his way to mounting the throne with the abdication of his father is a crucial component in the arrangement structured by the White House, bringing with him Egypt, and the Gulf principalities. Saudi Arabia, it would appear, has, under the influence of the White House, informed the Palestinian Authority of its expectation that it would accede to the U.S.-brokered peace talks bringing peace to its final conclusion between Israel and the Palestinians. As if it could be readily accomplished. As if the Palestinian leaders and their Arab nation counterparts hadn't over generations, persuaded their populations that Israel has no business settling itself comfortably in the Middle East and Jews can be trusted and relied upon to be good neighbours. The Arab street has been so persuaded through official government channels to believe Israel to be a foreign interloper, so inculcated with suspicion and hatred, those same leaders are now facing the prospect of rejection of a move to recognize Israel's right to exist just where it is. Above all, Mahmoud Abbas, who has never stopped portraying Israel as a malign force determined to eradicate the presence of Palestinians, rewarding Palestinians who commit themselves to martyrdom services to the cause of "resisting" the "occupiers" and "oppressors" of an "apartheid state" knows full well that if he accedes to any agreement with Israel whereby the two countries could conceivably live amicably side by side, his life would be forfeit, and Hamas, the oppressors of the Gazans, would take over the West Bank by popular concurrence. Palestinians who consider themselves hapless victims, a steadfast belief fostered both by their leaders and aided and supported by great swaths of the international community remain devoted to that vision of themselves. 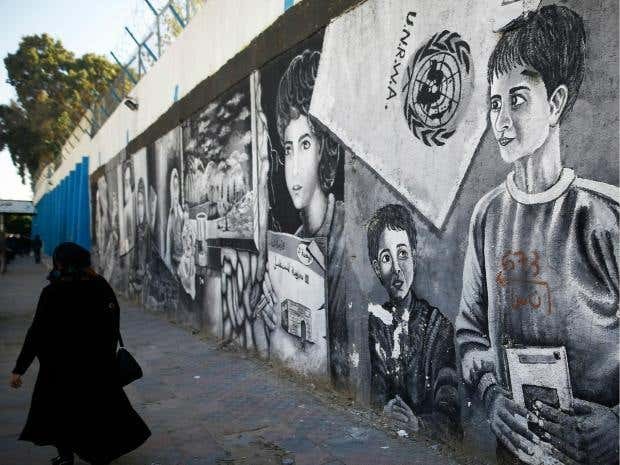 The United Nations refugee body (UNRWA) established singularly for the purpose of representing Palestinian refugees' interests has ensured that the Palestinians remain refugees. They appeal to the international community as pitiable victims of Israeli aggression, even while the P.A. urges aggression against Israel and rewards those who commit deadly violence. Palestinian leaders have effectively painted themselves into a corner with their determined portrayal of themselves as leaders of a pathetic nation of refugees unable to exist without the endless support of the international community whose financial contributions enable the victimhood-refugee status they so firmly cling to. The PA agenda of undermining Israel through slanderous public relations claims, and the Hamas intransigence on Israel's existence both lead to sacrificing Palestinian lives and aspirations to normalcy in the greater interests of destroying Israel. "I've been asked if I'm worried about one of those Russian Arctic battalions marching in here. I am worried -- but its because if they did that we would have to launch the biggest search-and-rescue mission we've ever done." "If that was my sovereign territory [where about 12 million Russian citizens live near or in its Arctic region] I'd do the same." "It's not about 'fixed bayonets' in the North." "Operation NUNALIVUT 2018 is more than winter warfare training. It is a unique opportunity for deployed members to conduct sovereignty patrols, ice diving activities and support the scientific community. Regular and Reserve members of the Canadian Armed Forces will come together with other government departments and agencies to cooperatively work on multiple objectives during the coldest period of the year in the Arctic." "We're learning a lot from the Rangers." "It's wild here. It's a big eye-opener to see the High Arctic." "The Arctic is unforgiving" says Captain Shawn Claire of the Princess Patricia's Canadian Light Infantry, a unit among others taking part in this year's Operation Nunalivut, a month-long annual exercise in Canada's Arctic. "She will claim lives and she will claim limbs", he stated. The Arctic Response Company Group from 38 Canadian Brigade Group and the 1st Canadian Ranger Patrol Group along with the PPCLI, some 350 members of the Canadian military in all, are at Resolute Bay conducting Arctic survival training, sovereignty patrols and scientific research. All are also testing their ability to survive in the Arctic. Temperatures at Resolute Bay during the months of January and February drop to around -65C to -70C at night, a temperature where it takes all of two minutes for exposed skin to succumb to frostbite. Wearing goggles and face masks the troops are equipped to withstand the extreme temperatures. At the time of their deployment from the end of February to March 22, the temperature hovered around -40C. Trucks must be kept running full time to ensure they can be operative; it is too problematic to start them in the frigid extremes. The month was spent conducting Arctic survival techniques among other concerns, and gave navy personnel the opportunity to test their ability to dive under ice. International interest in the far North has accelerated in the last few years. China released an official Arctic strategy, with plans to spend up to $1-trillion, in the development of polar regions in their eagerness to develop new trade routes as well as ports in the Arctic. It has no territorial claims, however, on the oil, gas or mineral resources known to be present in the area. Russia does have such claims. And it is busy expanding military bases in their own northern territory to the extent of creating new battalions to operate in the Arctic. Brig.Gen. Nixon is convinced the Russian investments geared toward renewed infrastructure and bases as broad as it seems, is in reality a fraction of what it spent during the Cold War. An unsettled dispute around Russian claims to the Continental shelf just happens to coincide with Canada's claims to much of that same area. Logistics represent another giant challenge to operating in the Arctic, beyond survival, but inextricably linked to survival. Giant C-17 and Boeing 737s along with C-130 Hercules aircraft are utilized in the transport of equipment and food. 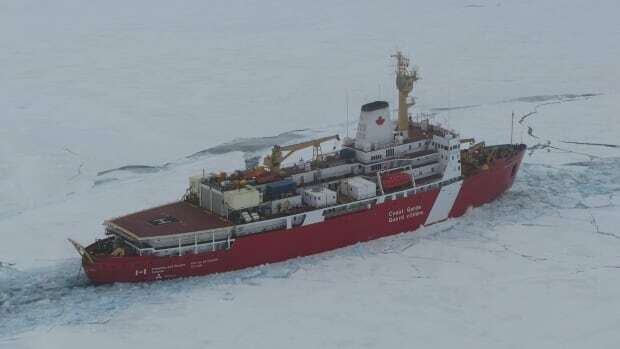 The Arctic Training Centre in Resolute Bay would be incapable of operating without its needs being filled where each summer ships carry in 60,000 litres of fuel to operate military snowmobiles and all-terrain vehicles. Opened in 2013, the training centre represents a major hub for northern military operations. Hugely and solely dependent on large diesel-powered generators to provide electricity needed not only for the military bases but for the 24 residential communities in Nunavut. And those generators, needless to say, require hundreds of thousands of litres of fuel. The deployment of the annual military mission takes eight months in the planning stages. Canada's northern population is a little over 200,000, most located in a few population centres like Yellowknife and Whitehorse, the remainder in small communities. Cambridge Bay has a population base of around 1,700 while Resolute Bay's population is roughly 200 people. North of Resolute at Intrepid Bay, soldiers have established a small camp where they conduct patrols out of and test the resupply system. Patrols are carried out on snowmobiles to prevent an energetic buildup of perspiration that can result in frostbite. Military mechanics must deal with constant mechanical breakdowns of machinery in this extreme climate. Reliance by regular troops on the Canadian Rangers cannot be overstated. The Rangers are comprised largely of Indigenous people, along with 4,000 reservists operating across the Canadian North. The Rangers teach soldiers, among other skills of northern survival techniques, how to build wind blocks from snow, and best practices in maintaining snowmobiles running in extreme cold. Also deployed are scientists from Defence Research and Development Canada and from Natural Resources Canada, who are examining whether batteries that can be recharged from a snowmobile could help make life less complicated for troops for the provision of light, heat and cooking. In a ten-person military tent at present, a Coleman gas stove and lantern are kept on all night so that while it is -55C outside the tent, heat from stove and lantern raise interior temperature in the tent to around freezing. The Canadian Rangers -- like Master Corporal Matthew Manik, 36, an Inuit whose long traditions and lifestyle skills are so valuable to understanding how to survive in the North -- are regarded as the critical eyes and ears for the Canadian Forces.